How I made myself half the man I used to be, more or less. 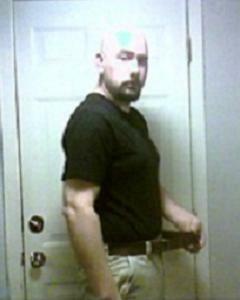 As you may or may not know, in about 9 months during 2006-2007 I reduced my weight and general body type from a gigantic fatass of 300+ lbs to a slender 174 16 oz. increments. I did it by paying attention to my body, and what I was putting into it. Since losing the weight, I’ve been using the same menu, and throughout what was probably the most stressful month of my adult life (trust me on this one), I maintained the same size and weight, even with a bunch of serious bread use and rum consumption. So I decided to keep it, and share my success. What I will not do is rip off the folks who produced the plan in the first place, so you’re going to see the end product, not the process by which it was generated. Nor will y’all have access to the e-book that accompanies the menu generator. If you’re interested trying out a menu, I highly recommend the one I’m using. (ed note. at the time of this pages creation, I was looking to crack 170lbs , with a goal weight of around 165 by the following Friday. Check out June 22nd, 2007 to find out how I did — SJM). For the record, I’m not anorexic. I’ve just become very aware of my body and its composition, and there’s some more adipose in places I don’t want it to be. UPDATE: 1/5/2010 Last year was not the best for anyone, but for me the highs and lows included a lot of food. Working on changing that, one cycle at a time. Here’s some links to the process.